The southern Cyclades of Greece with Santorini as the main cynosure, but the surrounding islands are well worth a visit too, in particular the lovely islands of Milos, Folegandros, Sikinos, Astypalaia and of course Amorgos. Further north are the islands of Paros, Naxos and the little Cyclades just south of Naxos island. Sikinos in the image above shows an illustrative Chora - the main dwelling usually situated at a secure height. Sikinos was known in ancient Greek times as Oinoe, Island of Wine and it differs greatly with the surrounding venue such as Santorini or Ios in hardly being developed and totally of the beaten track, few visitors arrive here which is ideal for your yacht charter holidays! Just two dwellings: the harbour and the Chora at the usual elevated position above the port. Near the quay there are some restaurants adjacent to one of the large small grain beaches of the island. Vestiges of the ancients can be found in a few inspiring ruins, which are however difficult to reach, most of the roads are unpaved and lead to the once intensely used agricultural terraces. Sikinos is a quiet gem and highly suitable for sailing holidays and yacht charters in the southern Cyclades of Greece. 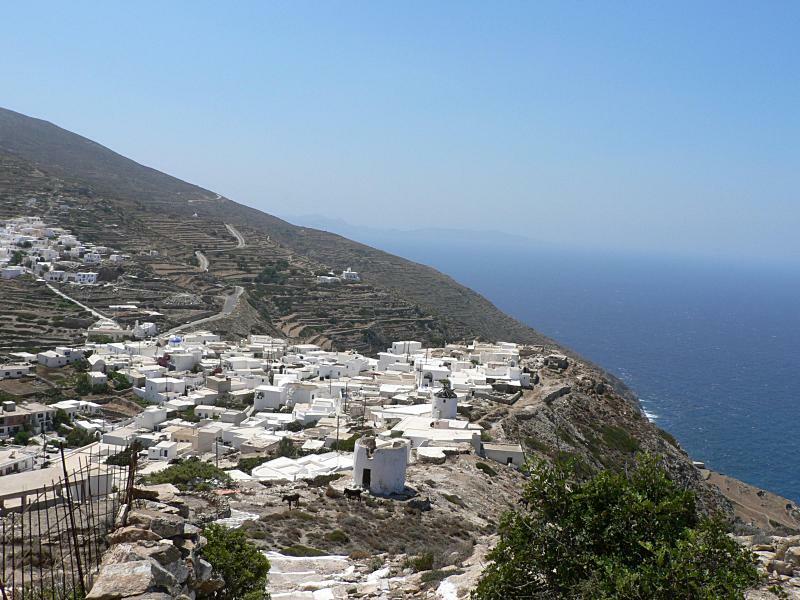 Nearby Folegandros with its Karavostasi ports offers a more approachable Chora. In the port ask for the only taxi to bring you up to the Chora. Other photos of the Chora of Milos and the Chora of Kythera or Kythira.